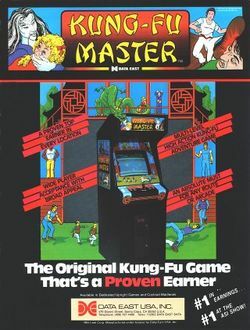 Kung-Fu Master is the undisputed grandfather of the Beat 'em up genre. It was the earliest game to feature a lone martial artist who must go up against a massive army of less capable fighters, as well as bosses that require special strategies to defeat. The main player does not die from one hit. Instead, he has a life bar that decreases every time the player fails to dodge an attack. The player may choose between punches or kicks, high or low attacks, and jumping or crouching. Known as Spartan X in Japan, the game was actually based upon a movie of the same name which starred Jackie Chan. More of a comedy than an action title, the game's story is taken directly from the movie, but the content differs quite a bit. Some of the content is actually inspired by several Bruce Lee movies. The 5-Floor Pagoda as well as the third boss who mimics the giant Kareem Abdul-Jabbar is taken from "Game of Death". The shot of a kidnapping letter and a tied-up girl in a red dress is taken from "Bruce's Finger". And the red pillars and ceiling tape were inspired by "Goodbye Bruce Lee, his Last Game of Death". Because the success of the game roughly coincided with the launch of the Famicom in Japan, Nintendo saw the game as a must-have title for their system. So they licensed the game from Irem and published it themselves. It was the third best selling Famicom game released in 1985, selling approximately 1,420,000 copies in its lifetime. When they brought the game to America, they shortened the title to Kung Fu, perhaps to avoid legal problems with Data East who held the rights to the game in America. Data East licensed the game to popular European home computer systems, while Activision (later, Absolute) provided ports to popular Atari systems available at the time. Thomas, the game's hero, and his girlfriend Sylvia are suddenly ambushed by a group of unknown assailants, and Sylvia is kidnapped. Thomas receives a ransom demand from the mysterious 'X' informing him that Sylvia is being held in the Devil's Temple. Thomas must kick and punch through the five enemy-packed floors of the temple to reach Sylvia and rescue her. A fearsome guardian awaits the player at the end of each floor, and must be defeated before Thomas can continue his progress up through the temple. Thomas begins on one side of each floor of the building, and must advance to the other end of that floor, through five floors. Thomas must defeat the boss of each floor, before gaining access to the next floor (or saving Sylvia on the top floor). Thomas must avoid contact with enemies. Some enemies attack Thomas for a certain amount of damage, while other enemies grab Thomas and drain his energy. If enemies latch on to Thomas and drain his energy, the player must shake the joystick back and forth to shake the enemies off Thomas. Thomas must defeat enemies by punch or kicking them when they are within strike range. Boss enemies have life bars as well, so Thomas must hit the enemy enough to deplete their energy. Thomas loses one life whenever his health meter is fully drained of energy or if time runs out.